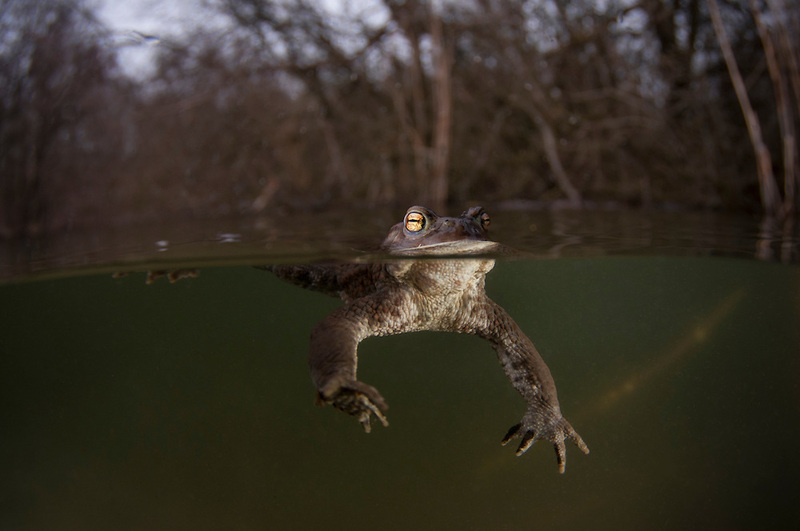 Even the smallest water movement like me moving the underwater housing has to be checked out by the eager male Bufo bufo in mating mode for 4-5 days in the spring. This one a bit confused looking into the dome port seeing himself as a rival looking for females. The common toad (Bufo bufo) or European toad is an amphibian widespread throughout Europe, with the exception of Iceland, Ireland and some Mediterranean islands. Its easterly range extends to Irkutsk in Siberia and its southerly range includes parts of northwestern Africa in the northern mountains of Morocco, Algeria, and Tunisia.